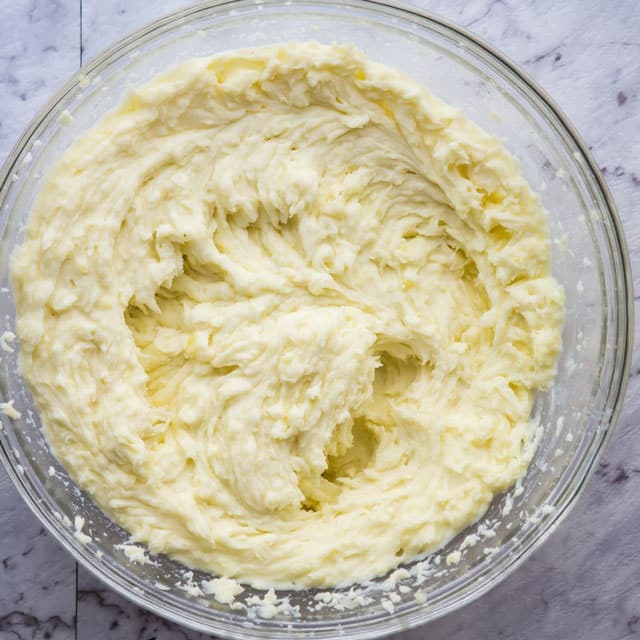 This is a recipe for classic Mashed Potatoes, with a handful of ingredients that always results in the most delicious potatoes, totally whipped and fluffy. Learn How To Make Mashed Potatoes that are incredibly delicious, creamy and buttery. You can’t go wrong with my mom’s version! I can’t believe that after all these years of blogging and sharing recipes with you, I’ve never shared my mom’s classic recipe for mashed potatoes. And I say classic because she’s been making these all my life. Mashed potatoes really are my favorite side dish, no ifs and/or buts about it. But this is the way my mom has been making these potatoes for years and it’s a no fail recipe. What makes my mom’s recipe different? Well I’m sure it’s not different than many of the mashed potatoes recipes out there, but it is a bit different than how I make mine, not so much in the ingredients, but the way we mash them. 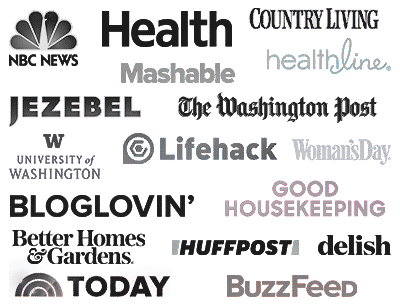 Potatoes – I prefer Yukon Gold potatoes or Russet Potatoes. Salt & Pepper – I usually use white pepper but black pepper works as well, especially if you like to see the black specks in the potatoes. Butter – I always use unsalted butter in most of my cooking and baking because this way I can control the amount of salt that goes in my food. Half and Half or Milk – My mom usually uses milk but if you would like these potatoes to be a bit creamier go with half and half cream which contains 12 % fat. You can even go ahead and use heavy cream which usually contains 38 % fat. Mom usually goes all out when she makes our Sunday suppers and her mashed potatoes are always light and fluffy and totally whipped. She always uses a mixer to whip them up. I’m a bit lazier than her and I just use a potato masher. Granted, my mashed potatoes aren’t as fluffy, but still good. Best potatoes for mashing are higher starch potatoes like Yukon golds, my favorite, or Russets. These potatoes will result in the fluffiest, smoothest and most flavor-packed mash. Of course you can use other varieties of red or white skinned potatoes, but they will require more mashing in order for them to become creamy. Peel and cut your potatoes. Make sure you cut your potatoes in cubes of equal size so that they cook at the same time. Place them in a large pot and wash the starch off until the water is clear. Did you know that removing the starch reduces the carbohydrate content, which is perfect if you’re on a low-carb diet! Fill the pot with cold water, enough that it fully covers the potatoes and add about 1 tsp of salt. Boil them for about 15 minutes or until fork tender. Drain the potatoes, add the required ingredients such as butter, milk or half and half, salt and pepper. User a mixer to get them nice and fluffy and until they start to form peaks. Always taste for seasoning and adjust with salt and pepper as necessary. Potatoes: Use the right potatoes as Yukon golds or Russets. Salt your water: Just like you always salt your pasta water, you need to salt the water that the potatoes cook in. The starch granules swell and absorb water and salt. If you add salt while cooking the potatoes, you won’t need to add as much later on. Drain your potatoes well after cooking to avoid mushy potatoes. Butter: Let the butter come to room temperature before melting it into the hot potatoes. 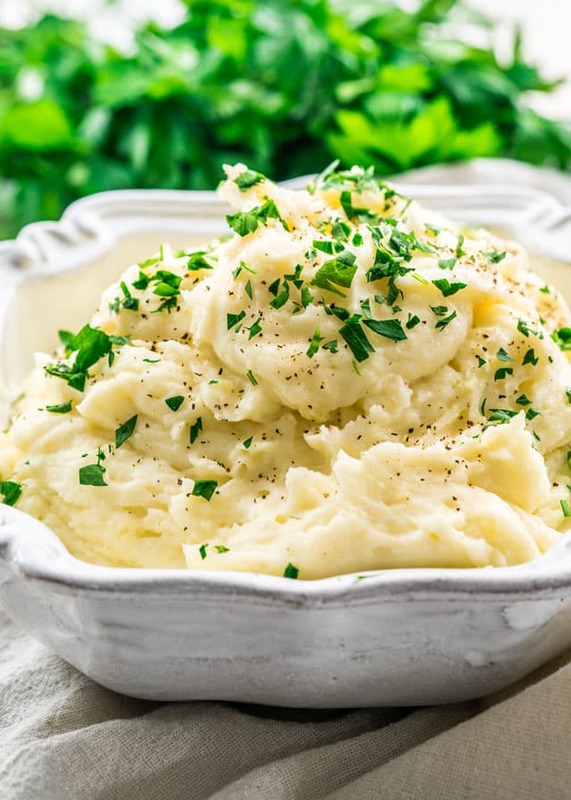 Although you can store leftovers mashed potatoes in the fridge, they are best when made fresh. Store leftover mashed potatoes in an airtight container in the refrigerator for 3 to 5 days. You can also freeze them in an airtight container or freezer bag for up to 10 months. 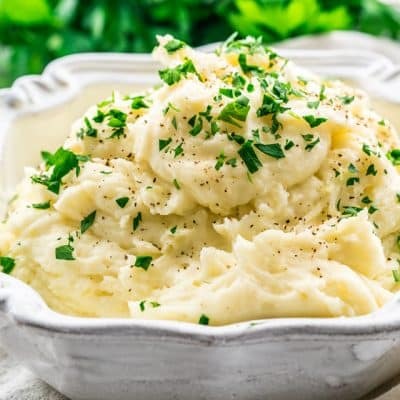 This is a recipe for classic Mashed Potatoes, with a handful of ingredients that always results in the most delicious potatoes, totally whipped and fluffy. Learn How To Make Mashed Potatoes that are incredibly creamy and buttery. You can't go wrong with my mom's version! Prepare potatoes: Make sure all the potatoes are cut into equal size pieces so that they all cook at the same time. Place the potatoes into a large pot and fill it with cold water, enough to fully cover the potatoes. Add about 1 tsp of salt to the water and stir. Boil potatoes: Bring the potatoes to a boil over high heat, then reduce the heat to a medium and cook for about 15 minutes or until the potatoes are fork tender. Drain and add the rest of ingredients: Drain the potatoes and add them to the bowl of your mixer. Mix the potatoes using the whisk attachment on medium until mashed. Add the butter, half and half, white pepper and a pinch of salt. Mix until smooth: Mix the potatoes until smooth and fluffy. Taste for salt and adjust to taste. Potatoes: I used Yukon gold potatoes, but russet potatoes would work as well. Leftovers: Store leftovers in an airtight container in the refrigerator for 3 to 5 days. Freezing: Freeze mashed potatoes in an airtight container or freezer bag for up to 10 months. Have you ever added cream cheese to mashed potatoes? Try it sometime. I bet you’ll like it. My husband makes ours and they are swoon worthy. That sounds amazing! We’ll have to try it. 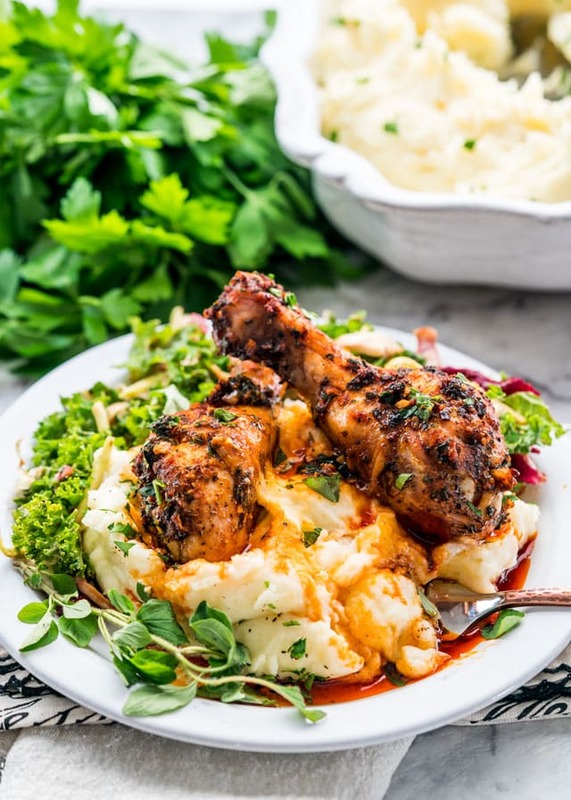 I made your garlic and smoked paprika chicken with the slow cooker mashed potatoes for dinner last night. OMG everything was sooooooo good. The chicken was fall off the bone tender and the marinade was full of flavour and had just the right amount of heat for a cool autumn night. 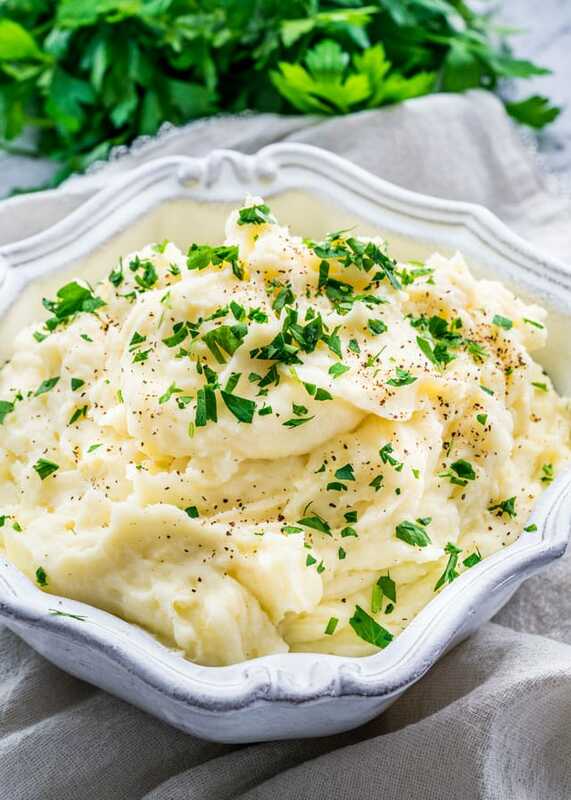 As for slow cooker mashed potatoes – where have you been all my life?! My daughter is a mashed potato fiend so you can be sure I will be sending this recipe to her. 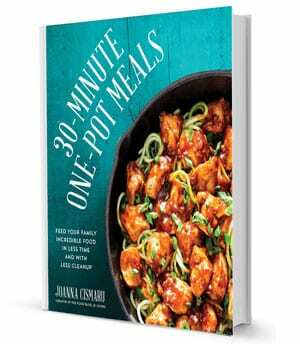 These are not the first of your recipes I have fallen in love with but I thought it was about time I said thank you. Between you and Nagi, I never have to look further than your sites when I am looking for dinner or dessert ideas. Awesome!!!!!!! Thanks, Carol! That’s so sweet of you! Like you, mashed potatoes are my favorite side dish, in fact my family almost drools as they are brought to the table. I grew up on a farm where foods of all kinds were plentiful from where our vegetable gardens & meats were raised kindly & well fed. Many of our meals found all family members together eating at the very large table. When the foods were discussed & who would make them my aunt was the only one who ever made the mashed potatoes. The creams & butters were more than plentiful & she used huge amounts freshly churned butter & BUTTERMILK. Our aunts legacy continues at holidays when we converge from around the world to celebrate together & you should hear the stories that each of us relates. I love your mashed potato recipe & will definitely make them sometime but our aunts “no recipe, just by looks” potatoes will always hold us in god stead. Mom’s food is always the best! This sounds exactly the way my Dad made them except he used a good old hand masher! Thanks for all your posts Jo!